The invention consists in the use of the clutch of a motorcycle to interrupt the accidental action of an automatic emergency braking system in order to guarantee the safety of the rider. Driver assistance systems will also spread to the motorcycle industry. Among these, the development of motorcycle emergency braking systems (MAEB) endanger the safety of the driver in the event of accidental operation. The invention avoids this risk by allowing the pilot to disengage accidental braking events, without affecting the safety potential offered by the safety system in situations in which MAEB intervention is beneficial. 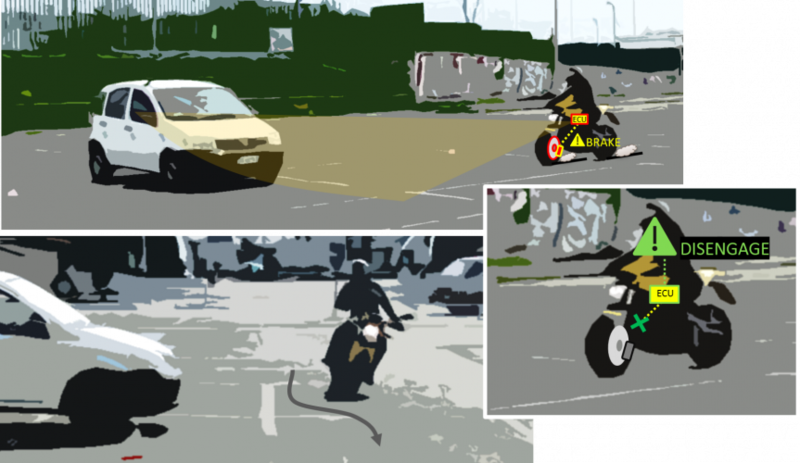 Development of rider assistance systems. Enhanced road safety by reducing the number of motorcycle crashes.